Another training camp, another quarterback battle for the New York Jets. But unlike the recent past, the competition in 2018 is legitimate. Teddy Bridgewater and Sam Darnold are not Bryce Petty and Christian Hackenberg. Josh McCown truly will be contested this year, and the best QB — not the best of the worst — will win the job. McCown has the advantage of being the incumbent. Bridgewater is creating some buzz as the new veteran. Darnold has pedigree and upside on his side as the rookie No. 3 overall draft pick. Head coach Todd Bowles and new offensive coordinator Jeremy Bates must decide what’s best for short-term winning without losing sight of the long game. Here are the pros and cons of all three candidates in a battle that will go deep into the preseason. McCown, who turned 39 on July 4, is coming off his second most efficient season as the go-to stopgap starter he’s become late in his resurrected career. His best work came with the Bears six years ago. In both cases, Bates was his quarterbacks coach. That gives him the least scheme-related concerns of the trio. He also proved to Todd Bowles in his first season with the Jets that he is the consummate team leader, living up to his vast and varied experience. He lifted a limited receiving corps to good production in a downfield-oriented passing game. Familiarity and chemistry with coaches and skill players are on his side, and he goes into camp as the clear No. 1. McCown was more consistent and durable than usual last season. He did miss the final three games with a left hand injury, and although he is in great shape again, history suggests he will show his journeyman form when overextended. 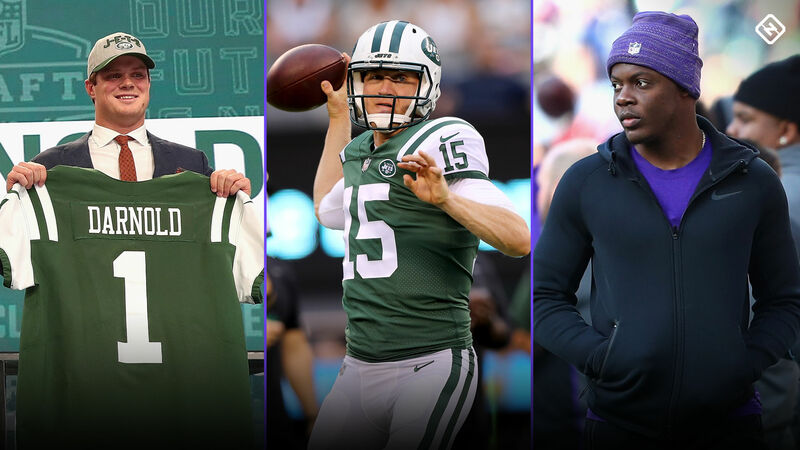 With McCown’s lead and Bridgewater’s positive trajectory, there’s no reason for the Jets to rush Darnold into action. But he can make it difficult for the team to play the patience game. The fact that Bowles and Bates have been open-minded about possibly starting Darnold right away is good news for the rookie. At the very least, the approach will make Darnold eager to absorb everything he can from McCown and Bridgewater to enhance his all-around talent as quickly as possible. To make it fair and to make sure Darnold will be ready, the Jets are not holding back or easing the playbook burden on the rookie. For Week 1, it comes down to who can deliver as a playmaker with confidence and not get by as a caretaker. Darnold is the youngest QB in the league, having turned 21 on June 5. He is also coming off a turnover-filled final season at USC. Even with his prototypical profile, he needs a degree of polish and can’t be trusted to be efficient enough for the Jets to feel comfortable with him initially. In Cleveland, Baker Mayfield has no shot to overtake Tyrod Taylor; Darnold in New York has the second toughest path to starting as a rookie first-rounder. McCown and Bridgewater are stronger combined options than Sam Bradford and Mike Glennon ahead of Josh Rosen (Cardinals) and AJ McCarron and Nathan Peterman ahead of Josh Allen (Bills). The Jets have an unusually good QB room for so-called QB have nots. They have the luxury of a willing helping hand in McCown so Darnold can develop on the bench without a trial by fire. While there will be temptation to start the rookie, cooler heads say the earliest action Darnold should see is late in fall if the Jets are out of wild-card contention. McCown should win the competition, but the Jets are the big winners for setting themselves up to get the best out of him, Bridgewater and Darnold without setting the team back.